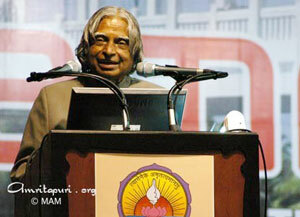 The Mata Amritanandamayi Math first began trying to initiate projects in Kolkata, the capital of West Bengal, in 1998. But various obstacles always arose. But as the saying goes, ‘if you keep knocking, the door will open; even if it’s not the targeted one’. In a similar manner, though the Math was focusing on Kolkata, things started coming up in Durgapur, West Bengal’s foremost industrial city, located 175 kms from the capital. Around the year 2000, the Math applied to the communist Bengal government for an allotment of land for an Amrita Kuteeram housing colony. In 2001, after many meetings, the government allotted the land at free of cost for the housing colony. Thus began a new chapter of Amma’s mission, in West Bengal. Amma wanted to start free homes right away, but then in January 2001, the Bhuj earthquake struck, and the relief efforts there took priority. Construction of the school started in 2002 December, the construction of first 108 free homes was well in progress. The beneficiaries were identified jointly by the District Authority and the Math, and comprised of people from the lowest strata of society. The citizens of Durgapur and the surrounding areas showed their gratefulness, support and devotion to Amma by arranging a thunderous reception for Her on 17th March 2003 at the Amritavidyalayam site. More than 30,000 people attended the function, many of whom had to walk great distances to come and have Amma’s darshan. During that evening’s darshan programme, the keys of the houses to the first few beneficiaries were handed over be Sri Bansa Gopal Chowdhury, the Honorable Minister for C&SSJ, Government of West Bengal. This was the first time in history that a minister from a communist party shared a stage with Amma in West Bengal. Durgapur means “City of Goddess Durga,” and Amma, who is Durga personified, has come to reside in this town and in the hearts of the people who live there. 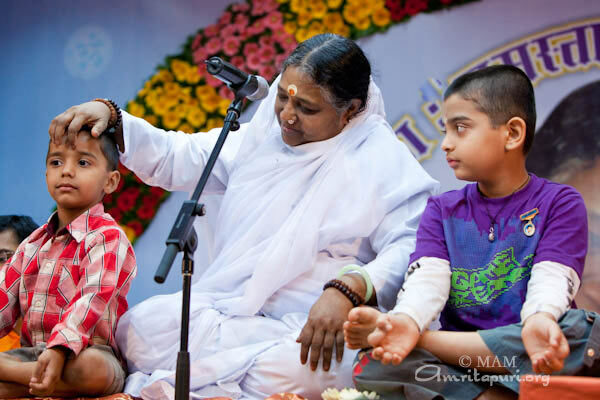 Question: Amma, in Your ashram, do You accord the greatest importance to devotion? When I watch the prayers and bhajans, it appears like a show to me. Amma: Son, imagine that you have a sweetheart. If you were talking to her, would it seem like a show to you? You can never feel so, if you really love someone, even though it may seem like a show to others. Whether the lover speaks to his sweetheart or she speaks to him, it makes them both blissful — they never feel dissatisfied. No matter how many hours they may go on talking, they are never bored by it. It is the same with the experience we derive from prayer. For us it could never be a show. Our prayers are an expression of our relationship with God and our closeness to Him, they are the conversations we have with our Sweetheart who dwells within us. You are the Atman (Self). Your true nature is bliss. You don’t ever deserve sorrow. You are not the jivatman (individual soul), you are the Paramatman (the Supreme Self). That is the inner meaning of prayer. Prayers are not empty words. Prayers and other devotional practices can be found in every religion. In Islam, for example, prayer is very important; and namaz (prostrations) is also a part of their practices. In Christianity prayer is vitally important. They pray before the form of Christ and before lighted candles. Prayer also has a significant place in Buddhism and Hinduism. In all of these religions the Guru-disciple relationship exists as well. Furthermore, we see prophets and Gurus appearing in our midst from time to time who are revered almost as much as God. Aren’t these different expressions of devotion? Those who have assimilated the scriptures contemplate Vedantic truths, and thus move forward on the spiritual path. However, even this is possible only because they have pure devotion towards the scriptures and their masters. Son, real devotion is to behold God in everyone and to love and respect everyone. You should cultivate such an attitude. We should elevate our minds so that we may see the Divine in everything. We do not think of God as someone dwelling in the heavens. God is the all-pervading Consciousness. To know Him and to experience Him is the purpose of our lives. The aim of shravana (hearing the scriptural truths), manana (contemplating on those truths), and nididhyasans (total assimilation of those truths) is to understand the nature of the Supreme Self or God. Devotion is a form of spiritual practice that leads to that experience. It is not easy to turn the mind, which has been wandering hither and thither for a long time, inward. Those who have studied the scriptures may prefer the path of “neti, neti” (not this, not this), rejecting everything except the Self. A lot of people, however, are unable to learn the scriptures, yet also have the right to realise the true nature of the Self. For them, devotion to God is the means. Some patients can take injections, but there are others who are allergic to them. In a similar way, Amma prescribes different spiritual practices to different people depending on their samskaras (their nature inherited from this and previous lives). We cannot say that one particular path is given prominence in this ashram. All we can say is that everything is aimed towards the good of the people. The two banks of a river appear to be separate only because the river is filled with water. When the water dries up only a single continuous stretch of sand remains — everything is one. So, too, it is because of our individuality, our individual consciousness, that there appears to be you and me. Once the individuality is gone, everything is one and the same — whole and perfect. Through both the “neti, neti” path and the path of devotion, we reach the same experience of the Self. The “neti, neti” path can be explained with an illustration: A child is bringing medicine to his father who is bedridden. When he reaches the door to his father’s room, the power supply fails. He is in the dark and he cannot see a thing. The boy fumbles along the wall and touches the door. “Not this,” he murmurs and enters the room. He stumbles against the table and says, “Not this.” He touches his father’s bed and says, “Not this.” Then finally his hand reaches his father. “Oh, yes!” he exclaims. “It’s my father.” In this way, by rejecting everything that is not his father, he reaches his father. The path of devotion is also similar to this. A true devotees attention is only on God. God is all he cares about. He doesn’t accept anything other than his Beloved. His only thought is, “My God, my God…” Finally through, his single-pointed devotion, he attains his beloved God. Some people contemplate, “I am not the body; I am not the mind; I am not the intellect — I am the pure Self.” Constantly seeking the Self, they reject the body, mind, etc., as the cause of all sorrows. Others hold that they belong to God and want only Him; they perceive that God is everything, and they seek that God alone. They, too, attain the same experience of this Self. This is the only difference between the two paths. Whichever spiritual path we are on, our aim is to cultivate an eye that sees everything as the form of God. This should become our very existence. We should be able to know and experience that everything is God alone. That is true devotion. When we see only God in everything, we forget our individual self. Our individuality dissolves and vanishes. Through devotion we are not seeking a God who sits somewhere beyond the sky. Instead we learn to perceive God in everything. A true devotee doesn’t wander about in search of God. God shines within his own heart, for he doesn’t behold anything as being separate from God. The purpose of his prayer is only to realise that oneness. Through our prayers we are glorifying the Supreme Truth. What is needed is to uplift the mind from the plane of the body to the plane of the Self. A hundred-watt bulb in a smoky kitchen doesn’t give the radiance of even a zero-watt bulb because it has been covered by soot over a long period of time. If we wipe the soot away, the bulb will once again shine with its full brilliance. Likewise, sadhana is the process of removing the impurities within us. By removing the covering that is blocking our innate divinity, the infinite divine power will become our direct experience; we will realize that we are not born to grieve or to suffer, but that we are the very embodiment of bliss. However, it doesn’t benefit us to merely prattle about it. Sadhana is imperative. Everyone has the innate capacity to swim, we have to enter the water and practice relentlessly. In the same way, devotion and prayer are the means by which we awaken the latent divinity within us. 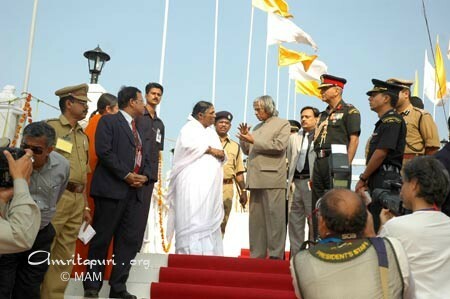 During Amma’s Jaipur programmes, a man approached Amma for darshan. He was feeling sad almost to the point of desperation: he was a 44-year-old bachelor, and his greatest desire was to get married. He did not say anything to Amma, but She whispered into his ear in his native language of Hindi, “ap ki shanti ke liye ma sankalp karengi.” (Amma has given a Divine resolve for your peace of mind.) But what the man heard was, “ap ki shadi ke liye…” He thought that Amma said she would make a sankalpa (Divine resolve) for his marriage. That very evening, at the programme itself, he met a lady. Three days later, the same man came for darshan in Delhi, where he asked Amma if She would conduct his wedding. She agreed, and before the conclusion of the Delhi programmes, he was married, his greatest desire met, his greatest worry put to rest. The setting sun turned the sky to dusk as the five ashram buses rolled along. The tour was beginning its fifth week, and our next destination was Baroda. It had been a long day of travel, with many hours remaining before we would reach our accommodation, and we were all eager for our sunset bhajan practice with Amma. But, when or where would She stop? It was getting late-why such a long delay? Some more time passed before the vehicles slowed to a halt, and our excitement grew. Are we stopping for bhajans now? Where is Amma? Eventually we arrived at our designated meeting area, and as we quickly exited the bus many of us looked around in bewilderment. Normally, our travel stops are located in some quiet nature setting: in rolling green fields, or in a beautiful forest clearing, or perhaps by a river or lake. But this spot was of no such beauty. We had come upon, of all things, a busy and noisy factory area, dusty truck stop, just off the main highway! I stared in disbelief at the row of unkempt buildings that lined the lot. Large vehicles were parked nearby, and there were piles of sand a few feet away. Workmen walked about busily, and the noise of loud voices, honking horns and machinery filled the air. Trucks roared past on the main road within walking distance. And here in the midst of all this din and activity was our beloved Amma, a serene smile gracing Her face as She sat in Her chair and gave satsang to the large crowd who gathered around Her…. I, too, watched Amma intently, taking in Her Divine beauty until I felt a tap on my shoulder. A deep voice called my name. I turned around, and to my utter surprise and amazement I saw an old acquaintance, Anil, who was a rickshaw driver hailing all the way from Trivandrum! I first met Anil almost ten years ago, during Amma’s Trivandrum Brahmasthanam programmes. Whenever I needed to go into town, Anil was always willing to take me, and always with a smile. He, too, was a devotee of Amma. Every year following that first time, whenever Amma came to Trivandrum I would always see Anil, who would also remember me and go out of his way to say a friendly hello. More recently, I had run into him by chance when he brought his family to Amritapuri for Amma’s darshan. And now here we stood together, thousands of kilometers away from Kerala, at almost the opposite end of the country in the northern state of Gujarat! What was the likelihood that we would ever meet each other here, at a truck stop in a land of a billion people? I asked Anil how he happened to be here. He explained, “I needed to earn more money. Things are very hard for me right now. Someone had offered me a job in this place, so I stopped driving the rickshaw and decided to come. My family is still in Trivandrum. I am working in the auto repair shop, right there.” He pointed to a small building nearby. “I had heard that Amma was coming to Baroda, and so I prayed and prayed, ‘Oh Amma, please come and visit me here!’ And She did! When I saw the buses coming, I couldn’t believe it!” Anil burst out in a joyous laughter. Later that night, as we all climbed back into the bus to continue our journey, I heard many remarks of speculation from our tour group: “Why did Amma choose that place? Why didn’t She go somewhere that was more peaceful?” I don’t think I will ever know why for certain, but in my heart one small answer was made clear: The Guru responds to a call from the heart. And somewhere in a small, industrial area in North India, one innocent devotee will have a memory to treasure for the rest of his life.